NORWALK, Calif. – March 21, 2016 – Cerritos College recently received a $25,000 donation from the Gene Haas Foundation to support scholarships for students enrolled in its Machine Tool Technology program. 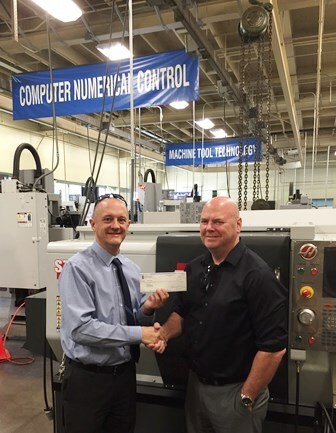 Glenn Cheshire, district manager, Haas Factory Outlet (Torrance, CA) presented a check to Nick Real, Ed.D., instructional dean of Technology Division at Cerritos College. Beginning this semester, students who have completed 10 units in the Machine Tool Technology department with a grade of C or better will receive a $200 scholarship toward purchasing books or tools. According to the Chancellor’s Office’s data, students with a certificate of achievement in machine tool technology earn $52,046 a year on average five years after graduation. The Gene Haas Foundation was created in 1999 by Gene Haas, founder and president of Haas Automation, Inc., the largest machine tool manufacturer in the United States. All Haas products are manufactured at the company’s facility in Southern California, and distributed through a worldwide network of more than 170 Haas Factory Outlets. The Gene Haas Foundation is committed to manufacturing education. Since 1999, the Gene Haas Foundation has been offering scholarships to high schools, community colleges and special educational programs that help build skills within the machining industry.